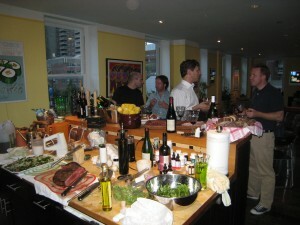 Gabrio Tosti di Valminuta dined and wined our gang of New York oenophiles on July 21st at his home in Tribeca. The multifaceted theme of the evening was white burgundy of Premier Cru status or better, and/or a 10yr + Tuscan single grape bottle of red. As with all dinners of our group, this one did not disappoint! We also had the pleasure of two new faces to our group, Piers Davies and Luigi Mercone. Both Piers and Luigi, showing excellent forms for their first event, stole the show for whites and reds respectively. Damn those newcomers! And now the moment you’ve all been waiting for, the reviews! The list below is ordered based on how we consumed the wines over the evening; summaries are provided at the end of each section for preference. 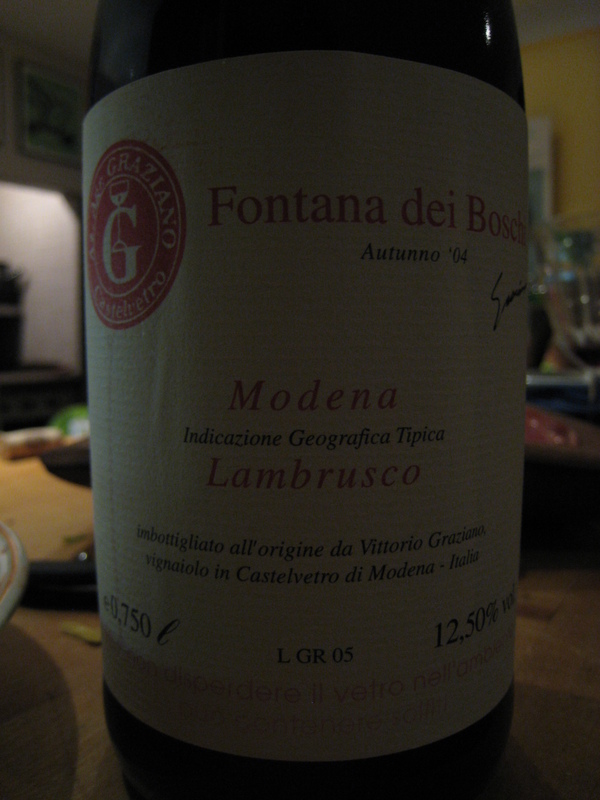 But first, our intro wine of the evening was a light and airy Lambrusco (Fontana dei Boschi, 2004). 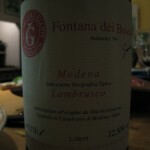 I’ve quickly discovered that a Lambrusco is about as refreshing a drink as one can have on a hot summer evening. This pleasant white was brought by yours truly. 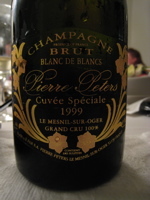 It featured minerality, with honey and tropical notes, a pleasant nose, and no oxidation. 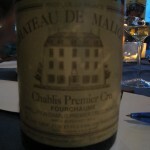 There wasn’t a ton of acidity and it had a short finish. 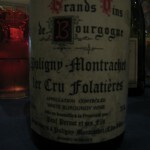 It’s very drinkable now and likely will not last that much longer in the bouteille. I also brought this delicious white burgundy from the cult producer, Domaine Raveneau. 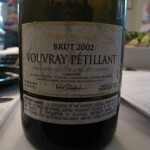 Our group described this wine as lemony, musty, very focused, with a sharp finish, like a rapier. Many reviewers have suggested decanting this bottle; we didn’t quite have the luxury of a full decant prior to consumption, but did manage to keep a sufficient amount in the bottle for a re-examination 1.5 hours later. Decanting white you say?! 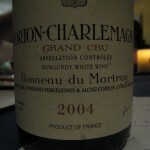 Yes, decanting did make a significant difference; the wine was immediately more expansive and rounder vs. the first sip. 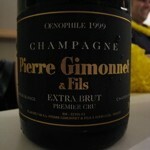 Nick brought this PM to the tasting. 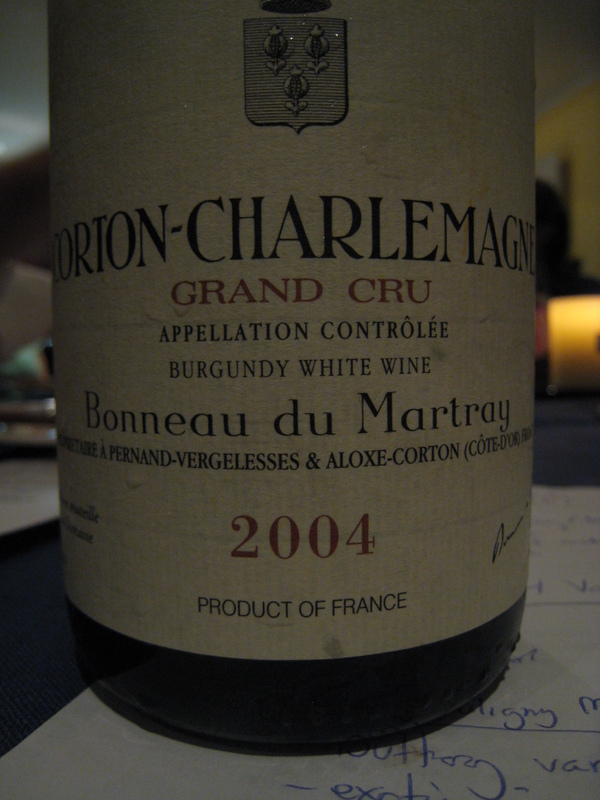 Our table review of the wine was as follows: buttery, vanilla (too much vanilla at the end), exotic, feminine and modern. 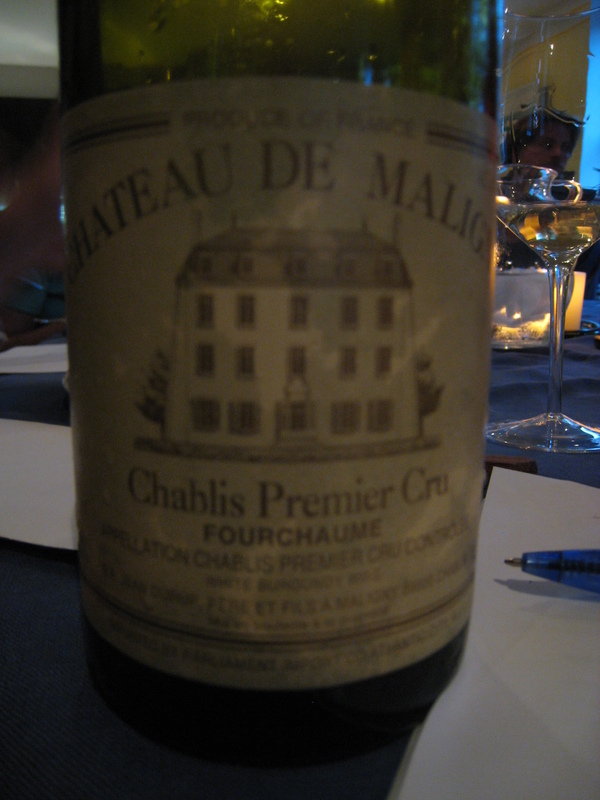 Ultimately this wine was disappointing, owing to that butter in the glass…a bit like a CA chardonnay in that respect. 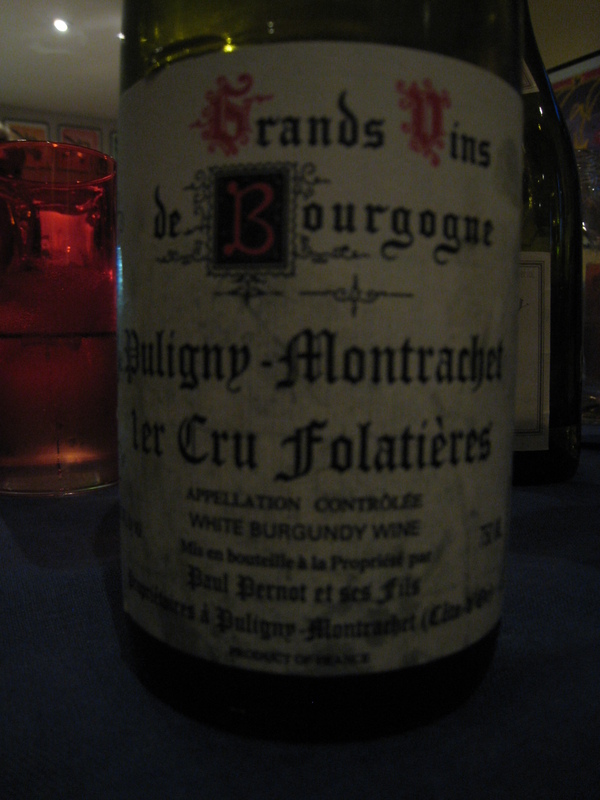 Piers made the wise move of decanting this bottle for 1.5 hrs prior to opening up for our group, and this wine stole the show of the whites. 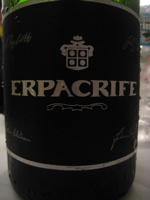 It had a lemon-confit nose, a caramel/dulce-de-leche essence in the taste, and a finish that went and went and went. DELICIOUS! 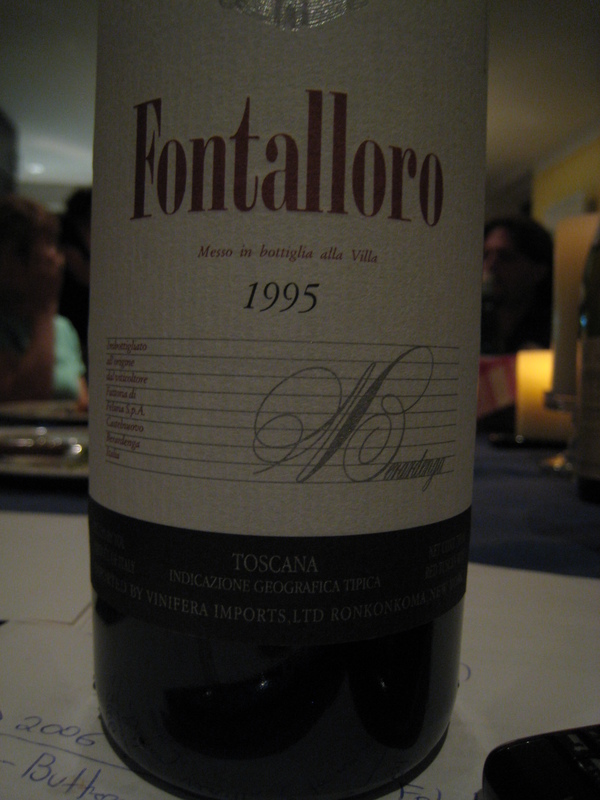 And now moving onto our Tuscan selection. Before we started, Gabrio reminded/informed us that the signature essences of the sangiovese grape are violet, cherry, and leather. This, our first red of the evening, evoked a variety of descriptions, including poo and a low-pressure system on the nose (as in, what the air smells like before a rain storm). 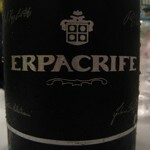 Blackberries danced in the glass, with low acidity and a dry extract of fruit. 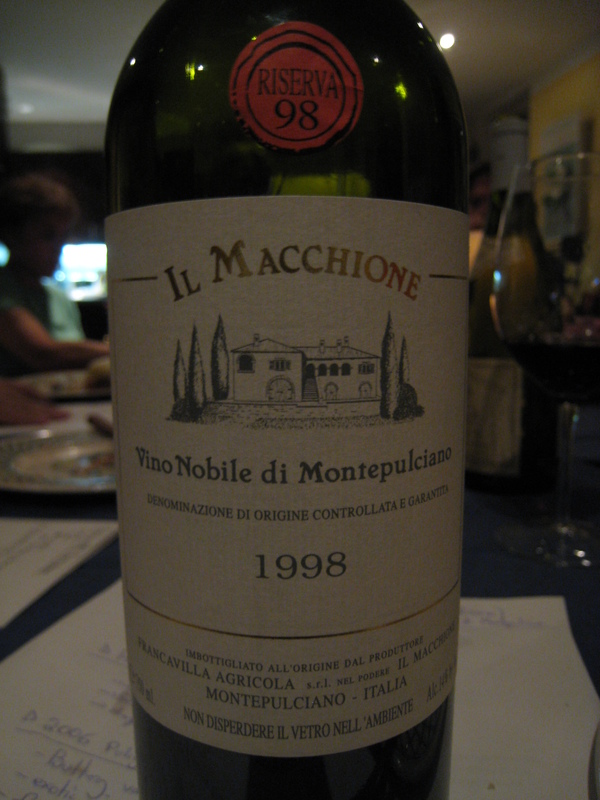 This was a text-book Sangiovese, what you want from Sangiovese, and no surprises (in a good way). Tina brought this wine (courtesy of Gabrio’s wine store). Another 100% Sangiovese grape, we had lots of violet on the palate. There was cocoa on the nose, with a definite expression of the terrior. The wine was tannic, and one comment came back as “infanticide in the bottle” while another referred to drinking this akin to “she said she was 19.” Bottom line: dressing up to look like more but ultimately performing with less. 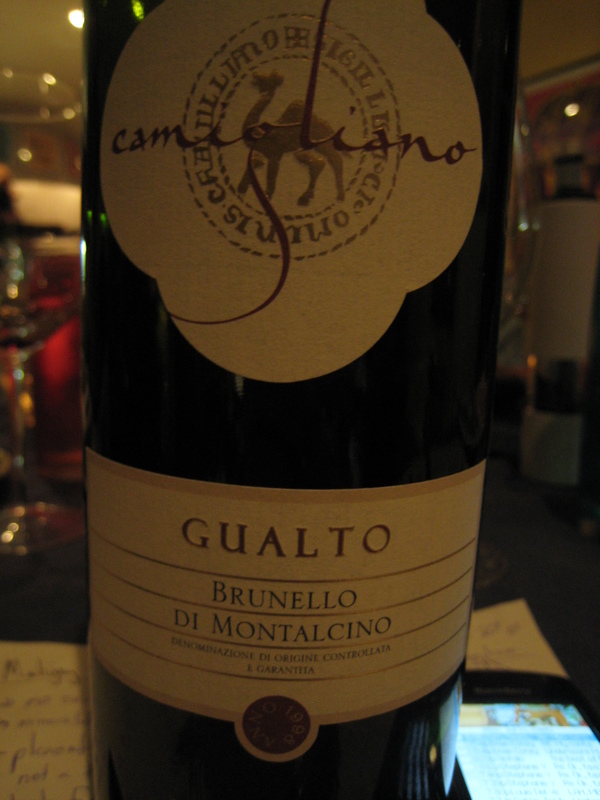 Robert brought this very berry of a camel red to the dinner. 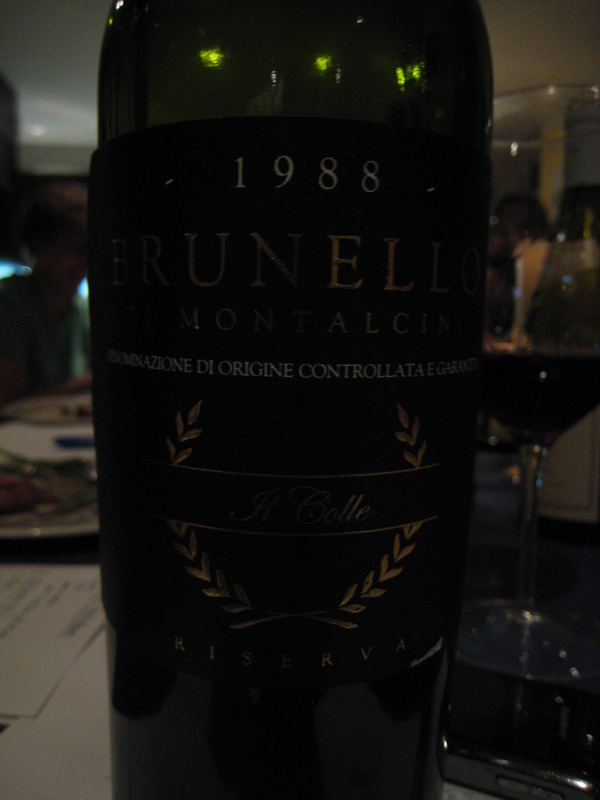 This was a “Parker Brunello,” designed to please the critics. 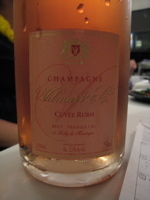 It had a nice nose, modern structure, but no expression of terroir and every expression of Jamba Juice in the glass. Piers took ‘wine quote of the night,’ describing this wine as “an overly designed pair of Italian jeans.” If you’re into that sort of thing, knock yourself out! 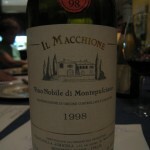 Luigi pulled out all the stops (or at least corks) with this 20 year old wine. On the nose: a fart and a whiff of cork. 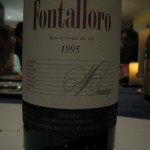 In the glass: leathery, singular in character (individual style conveyed from the wine-maker), esoteric, and ultimately very young for a 20 year old wine. 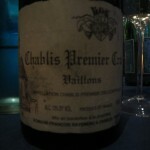 Find this wine if you can; it’s damn near impossible but a treat to consume amongst friends. 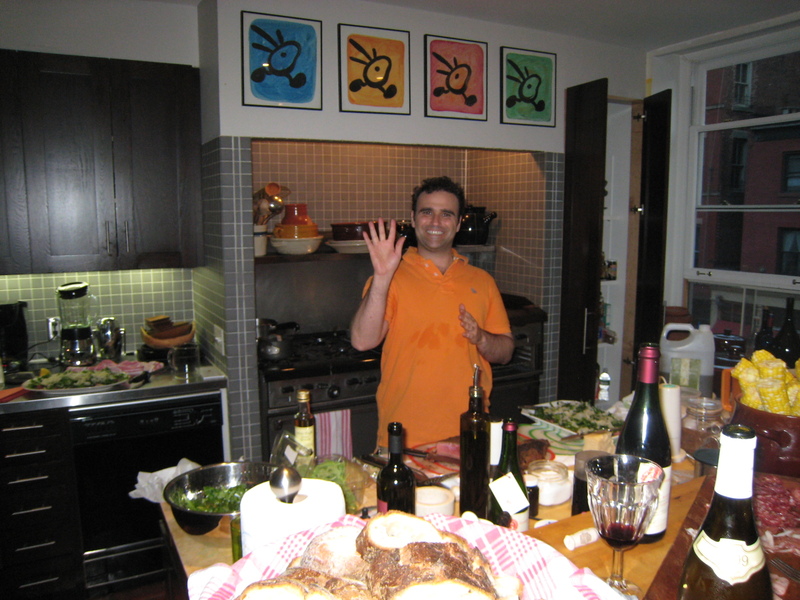 Fun wine facts: Alberto Carli, the owner of the winery, insisted on cellaring the wines until they were ready to drink. He kept the winery secret from his family until his failing health prompted him telling his wife of her inheritance (thanks to Jenny Neill for excavating this history). The last wine of the evening came from Gabrio; this elegant rosso was a finely balanced wine, with the violets and cherries expected of the varietal. 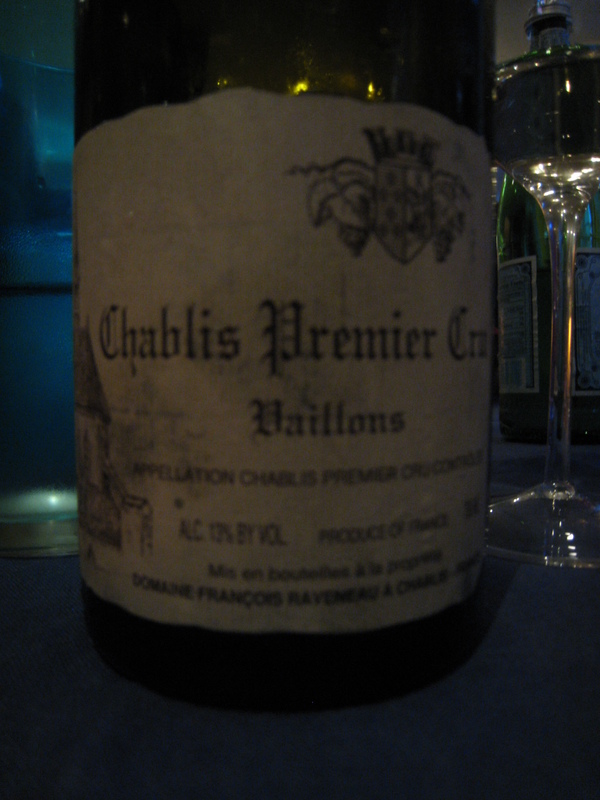 Pepper laced the finish, and we all agreed that this bottle was another infanticide…give it another 10 years. Overall, a great showing, but not quite enough to top the Il Colle. 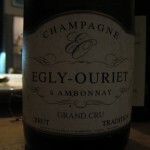 Finally, those of us who lingered (re: will clean for drink) towards the end got a delicious taste Egly-Ouriet Grand Cru Champagne. By this point in the evening I was a bit toast-pointed, so I don’t have any notes to share, other than I liked it more than I disliked it (OK, a little yeasty and melony). So, to sum up, thanks to all of our participants at this evening’s event. We obviously can’t do it without you, and I certainly appreciate the learning I come away with from each and every tasting. A gaggle of New Yorkers (along with imports) visited Interevco’s offices this evening to enjoy the hosting talents of Paul DeBraccio and his delightful thematic selection of small producer champagnes. 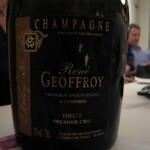 We found two doubles among the 14 different champagnes (or virtual champagnes) delivered by the group this evening. Overll, I think we were all delightfully surprised by the delicious diversity of champers consumed, all at very affordable price points (anywhere from $30 – $70) for non-vintage, vintage, and rose. The moral of the story? Veuve Clicquot, hovering around $40/bottle, is NO MATCH for superiorly produced champagnes from the “heart” of Champagne. 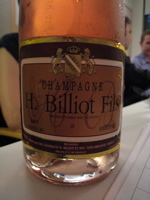 The Huet, brought by Nick Bumstead, is 100% chenin blanc, and comes from the Loire Valley. 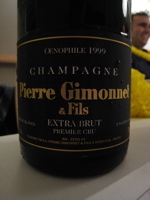 The group described it as citrus, candied, a little dirty, with straw, aggressive acidity, and linear minerality. Stephanie brought this NV champagne. It had a strong nose, but finished tart with a flavor of baguette. Stephanie, hedging her bets given her track record of wins for wine of the night, also brought this champagne. 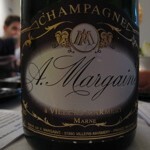 We described it as flat, with hints of bitter golden apple, big bubbles, and a prosecco-like finish. Aurelie brought this “done by the book” champagne. 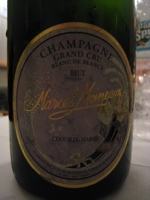 It has what you your mind might expect champagne to taste like, but no major flavor variation or color to the juice. 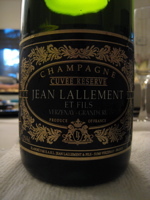 Michael Hirshoren brought two bottles of this producer, one of the oldest in Champange, to our dinner. 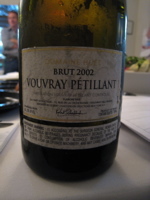 We described it as tinny, with a big attack on the palate but a very short finish. 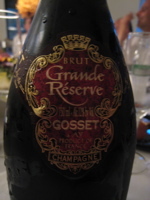 I’ve had the ’99 Gosset and brought it to a champagne dinner with our West Coast counterparts, so I was surprised that this one really didn’t stand up in the way some others did. 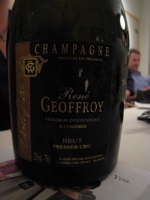 This was the crowd favorite of the non-vintage (NV) champagnes. Both Paul and Tina Ravitz shared this one with us, so we’re not quite sure whose bottle we drank, but the tie in this case goes to both runners. 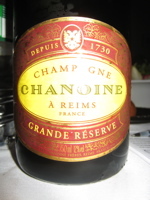 This bottle of Lellemant is made from 90% pinot and 10% chadonnay grapes. 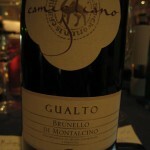 It was “winey”, full-bodied, very full in the mouth, and had a wonderful color. 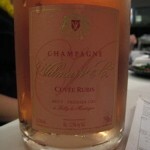 Nick, another overachiever who hedged his bets with 2 bottles, brought this delicious bottle of rose. 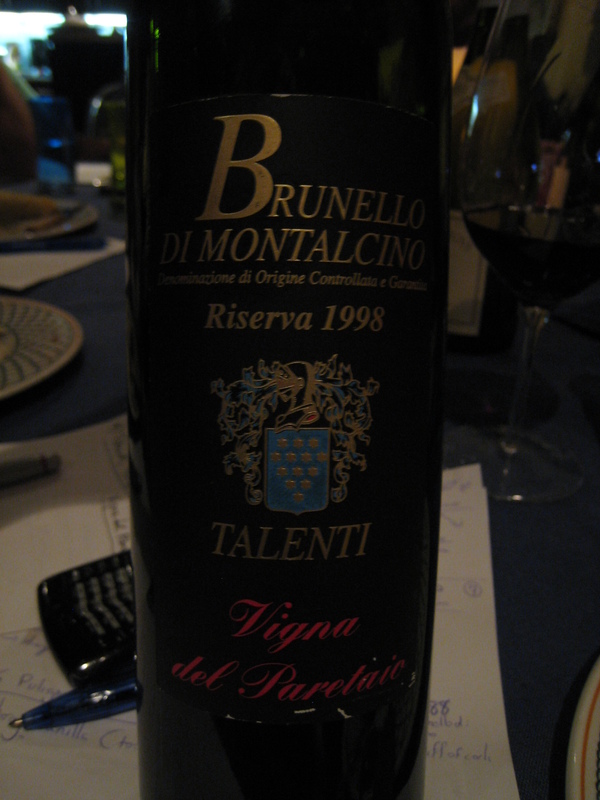 The group described it as delicious, port-like, elegant, rich, deep hints of raspberries, and with a long finish. 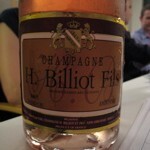 This was a really lovely bottle that could give a Billecart Salmon Rose a run for its money. 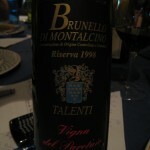 Our host for evening Paul DeBraccio contributed this bottle. 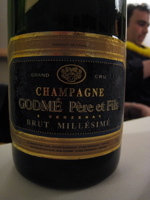 It was a bit overly acidic and sharp, but the full flavors were trying to come out (a little time would help…but with time, poor champagne gets warmer!). It had great potential energy, but little kinetic energy in the mouth. It would be interesting to open this one for 2 hours in a chilly bucket and give it another chance. This ringer sparkling wine came courtesy of Gabrio Tosti di Valminuta, the owner of De Vino, a specialty Italian wine shop in NY. This sparkling Italian wine is made from the Nebbiolo grape (kissing cousin of pinot). It was described as tannic, peppery, and with a hint of burnt rubber. This was a great flavor explosion, and a wonderful treat. Gabrio is the only person the US that has access to this sparkler, and the group really liked this one. 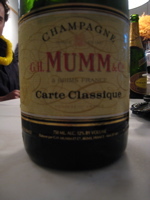 This was the first of our vintage champagnes, brought by Jim & Jocelyn Meskauskas. It was yeasty, with ginger, vanilla frosting, and as if someone took a buttercream frosting from a wedding cake and turned it into a champagne. 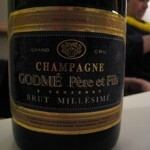 The second of our vintage champagnes was brought by Eric Porres (me). The first impressions were quite strong on this one: chalky, salty, rustic, like biting into a salted butter brioche. This particular champagne is made from grapes of 70+ year old grapes planted on 40 acres, and the vineyard sits right next to Salon and Krug, so it is in good company. I’d love to see this go up against those producer blind to see how it fares someday. 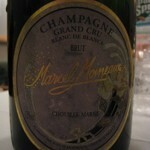 2nd favorite champagne of the night. 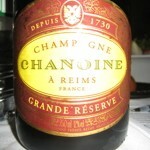 I can’t recall who brought this vintage champagne, but it was OK. The group described it like biting into a dry biscuit and not good with dessert (which is what were having by the time this one was poured). 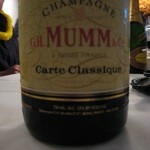 Like the Mumm, this champagne was done by the book but with little personality. 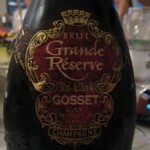 Gabrio also brought this wonderful bottle of vintage champagne. 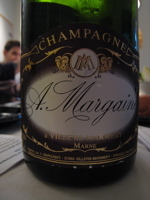 Mike Edelhart described this champagne as “as if it walked in for central casting for champagne.” It had a cheesy nose, focused on the palate, with feminine hips of flavor and a long, long finish. 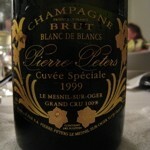 1st favorite champagne of the night. 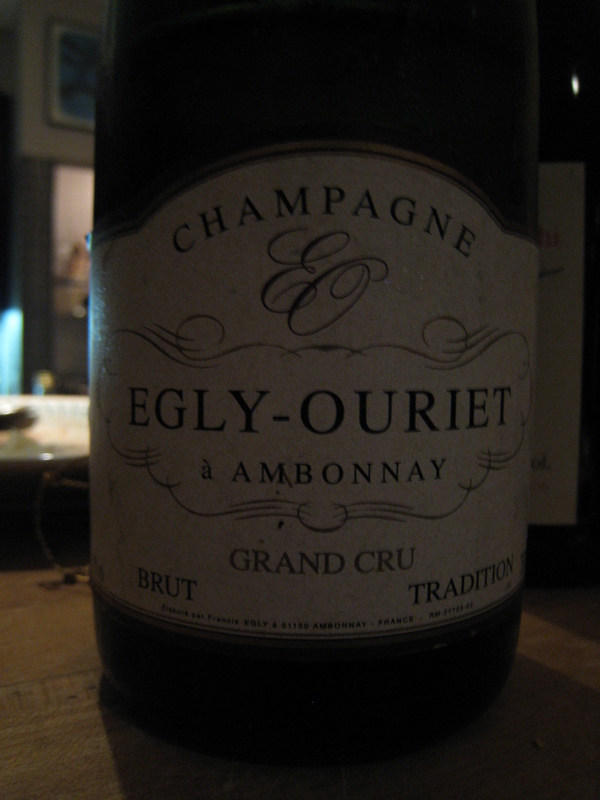 Our last champagne of the evening with was vintage courtesy of Jim & Jocelyn. We described it as a Chinese dragon (big on top, with a long small tail) and having flavors of candied beach. 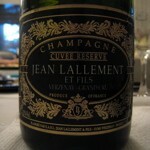 So, overall, we had a diverse range of champagnes, flavors, vintages, and aspirations to be the champagne of the night. The TOP honor with 5 votes went to Gabrio’s Godme, followed by Eric’s (mine) Pierre Peters with 4 votes (oddly enough, Gabrio voted for mine and I voted for his!). I would be remiss to exclude the TERRIFIC food, consisting of appetizers of shrimp, crabmeat puffs, and small doughy/vegetable poppers, followed by cheese, grapes, crackers, a selection of fruit, a mesclun salad with endive, entrees of chicken, pistacchio crusted salmon, and sides of roasted potatoes and vegetables, and waist-line expanding pastries. I’m sure I’ve missed something so feel free to comment. Note: Sabering a champagne bottle is NOT as easy as it might seem. We’ll have to practice this one…lots. 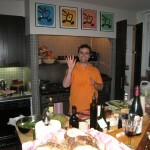 Our next event maaaay occur towards the end of July and hosted by Gabrio. Details will follow. Happy bubbly to all! 1997 Bartolo Mascarello wins Wine of the Night on the West Coast! Thanks to John Piccone who introduced us to Bartolo Mascarello (2001), a magnificent Barolo producer, I took a magnum of 1997 to the west coast group’s June wine dinner in Aptos, CA., and I am pleased to report that it won wine of the night! You can see Steven Comfort’s (west coast wine scribe) write-up here. 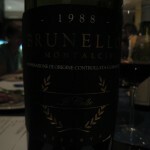 Posted in Dinner Recaps, Events | Comments Off on 1997 Bartolo Mascarello wins Wine of the Night on the West Coast! You are currently browsing the archives for the Dinner Recaps category. 20 mySQL queries executed in 0.404 seconds.